The North East has cemented its place as a leading player in the motor sector with the opening of its first prestigious Infiniti car dealership. The new centre, located at Silverlink Retail Park in Newcastle, covers the areas of Tyne and Wear, County Durham and Teesside. Renovation work on the former Honda site has developed a dealership with the style, look and feel of the brand, which prides itself in operating in a similar fashion to a five star hotel. Each Infiniti Centre is unique, with bespoke furnishing, creating a luxurious environment and Infiniti Centre Newcastle is no different. 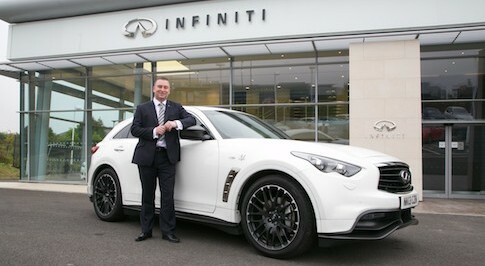 Every member of the Infiniti Newcastle team is a 'brand ambassador', led by General Manager Jeff Aynsley. Sold globally in 50 different countries, the premium Infiniti brand was launched in the USA in 1989. Currently manufactured in Japan and the United States, its first European manufacturing plant is set to open in Sunderland next year as the brand expands into Europe. Amongst other models, Infiniti Newcastle will be selling the recently launch Q50, a premium sports saloon packed with leading edge technologies alongside a full hybrid version designed with both performance and efficiency in mind, and the QX70 dynamic SUV. Robert Forrester, CEO of Gateshead-based Vertu Motors PLC, said: "We are delighted to be opening the doors to the first Infiniti Centre in the North East. Customers will see a completely unique and exciting design concept within the dealership with the Vertu Motors ethos of excellent customer service paramount. "Next year, the Infiniti Q30 will be manufactured just down the road in Sunderland, meaning we will have another car brand both produced and sold in the region, which is fantastic news for the North East.